From viewing the trailers and reading the premise, you’d be surprised to find that ‘Only the Brave’ isn’t the latest film to come from Peter Berg depicting a true life story of tragedy and bravery through a lens of masculinity (it’s directed by Joseph Kosinski). In many respects, ‘Only the Brave’ is a template movie, a tale of masculine bonding building to a tragedy at the end, yet it really won me over and I was deeply affected by the performances and the story of the Granite Mountain Hot Shots. The film features an ensemble cast including Josh Brolin, Miles Teller and Jeff Bridges, focusing on an elite firefighting force from a small town in Arizona, particularly susceptible to the dangerous effects of forest fires. The beginning isn’t promising. From the stock scenes of masculine bonding, complete with bad dialogue and thinly written characters, it felt like this might be a struggle, yet it quickly improved and won me over. Part of that is down to the performances which are uniformly excellent, from Josh Brolin’s gruff and passionate group leader (Eric Marsh), to Miles Teller’s junkie (Brendan McDonough) given a second chance, and affecting turns from Taylor Kitsch, Jennifer Connolly and Jeff Bridges. Secondly, it’s down to the characterisation which I had mentally written off after ten minutes. The core crew members begin to get fleshed out and they become more than the sum of their parts, with Kitsch’s rude, sexist firefighter developing a heart and the pockets of backstory about Brolin and Teller’s character making us care for them more. All of this is important as we know where this story is heading and it packs as much of a gut punch as expected when the inevitable does happen. Up to that point the film does a strong job of engaging the audience in the story of Eric Marsh and his crew, and I was fully invested in their attempts to get certified, but I felt their story was more powerful because they were local, working class guys trying to do the best for their community. That sense of community is important and it’s subtly shown through a scene at a local bar where the crew congregate to celebrate and through small moments that give off an ‘everyone knows everyone’ vibe. We follow the crew as they fight various fires, are introduced to the techniques (quite fascinating actually) and learn more about the characters through the interactions scattered throughout the work. The effects work is equally impressive, blending practical effects and CGI to show the sheer power and size of the fires the men are facing, emphasising the risks involved and the danger if a mistake is made. I particularly loved Kosinski’s shots of the vast Arizona forests, particularly when he’d move his camera from an untouched part to bring the raging fires into view, managing to be both beautiful and frightening at the same time. By the end of the film I felt emotionally drained and shattered by what I’d just watched, but that speaks volumes for how good the film was. 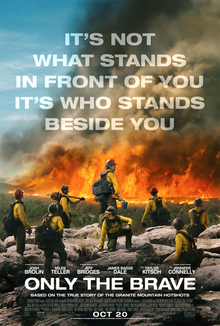 I thought ‘Only the Brave’ was a superb film and a touching tribute to the brave men of the Granite Mountain Hot Shots, well made with great performances and I’d highly recommend checking it out.